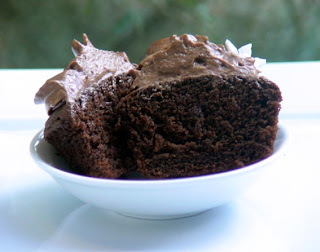 These beautifully moist and chocolatey cupcakes are entirely suitable for people who suffer from celiac disease and degrees of wheat intolerance. Line 2 maybe 3 x 12 hole muffin trays with paper bake cups. Combine the cocoa and boiling water in a medium bowl and mix really well , get out all the lumps. Allow to cool. In the bowl of your mixer combine ALL the dry ingredients on low speed for 1 minute. In another bowl combine eggs, vanilla and 1/4 of the cooled cocoa liquid. Add the softened butter and the main cocoa liquid to the dry ingredients and mix on low until moistened. Then increase the speed to medium for 2 minutes. Scrape the sides down then add the egg mix in 3 lots on medium speed beating well between additions. Grab your spatula and give the bowl a really good scrape and gently mix in any naughty bits from the base of the bowl. Using your regular ice-cream scoop, gently transfer level scoops of batter into paper bake cups. Bake for a minimum of 15 minutes then start checking. If not done but starting to overbrown, gently lay a sheet of aluminium foil over the top of the cakes. Cupcakes are cooked when they spring back if touched lightly in the centre . Allow to cool in the pans for 10 mins then cool on racks. Smother with your best G/F buttercream of choice ( most buttercreams are G/F anyway!) Just make sure that whatever icing sugar you use adheres to GF and avoids cross contamination of non GF products in manufacture. Drop me a line to let me know how you get on as everyones recipe interpretations can differ slightly here and there and I can help sort any probs out. Can you recommend a good gluten free flour? I've experimented combining tapioca flour, rice flour, and potato flour but haven't found anything I like yet. Thanks! 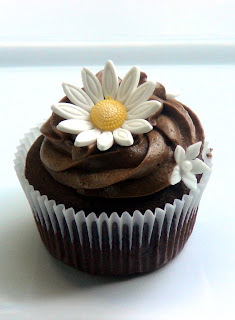 I was wanting to know if you are able to use bakels fondant for decorations on these gluten free cupcakes? Unfortunately , bakels fondant contains gluten, as they use icing sugar in there mix,(pure icing sugar)is needed, for gluten free use! This recipes are great, in fact my grandpa who likes to visit Viagra Online is always making recipes like this for us, that's why we love him.